Outbound Fax Settings is where you can change the information for your outbound fax. 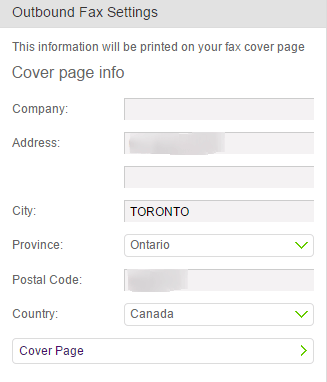 Here, you can edit the cover page information and the emails permitted to send faxes. This section will allow you to edit your cover page information. A cover page should contain information about the sender of the fax, and this will include your company information as well. There are various styles of fax cover pages. You can customize your cover page to suit your desired format by clicking on Cover Page. 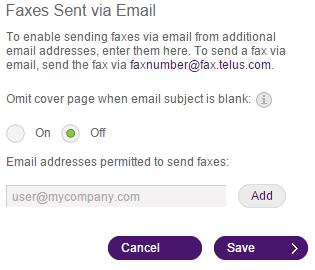 This section will also allow you to add emails that are permitted to send faxes. Clicking Save will retain the changes you have made in this section. For billing and account queries, call us on 1-844-626-6638, 8am - 5pm local time (Monday to Friday). Key in your Business Connect number to reach our dedicated support team.